You can’t run a successful event planning business without customers, so you need to impress every prospect that comes your way. But partnering with the wrong client can cost you time and money, both of which could be used to land more suitable projects. The size and scope of any event can change quickly, and you need to feel comfortable with the person who is paying the bills. This is why your initial client interview is so important. If you don’t get the answers you need, or if things just seem odd, you might want to take your services elsewhere to avoid a catastrophe down the road. What Is the Projected Date and Location for Your Event? This is perhaps the most basic of questions, but it is important for your client to provide a direct answer. It can be a bad sign if you sense a lot of indecision or conflict with this topic. Now, of course, some clients will need your help with choosing a venue, but they really should have at least a couple of places in mind. You can spend a significant amount of time shopping venues, and you’ll spend even more if the client has no idea what they want. The difference in cost between 200 and 500 attendees is massive, so if a prospective client gives you a wide-ranging count, then they likely have not done any research on costs. In this case, you’ll immediately want to proceed with the next question on the list. 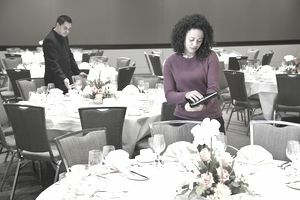 You may prefer to lead with a “per person” budget inquiry because it provides a better sense of how much thought the client has put into the event. Replies with blanket numbers like $5,000 or $20,000 are too distant from the guest experience. Whatever number your client uses to represent their budget, you should break it down into a per person rate so that both of you can see what you really have to work with. What Are Three Must-Have Elements for Your Event? After you know more about the budget, it is time to figure out if it is large enough to meet your client’s expectations. Must-haves can present a major roadblock in certain situations. Imagine your client wants a particular celebrity to perform at their event, yet they have no idea how much of the cost or whether that person is even available. These are the types of issues you need to address in the beginning, and you can’t always rely on the client to mention them. What Are Three Things You Don’t Want at Your Event? Although very similar to the previous question, adding the negative connotation can add significant insight for the planner. Say, for example, that the client is adamantly against serving chicken for dinner. A repercussion of this would be an increase in food costs. Without chicken as an option, you will need to consider beef or fish, both of which are typically more expensive. Understanding how a “no-no list” affects the big picture is a critical skill in assessing client compatibility. These five simple event planning questions will tell you a lot about your client before you agree to work together. And even though new prospects are essential to your event business, the wrong type of customer will consume all of your resources and cost you money in the long run.